Ekadashi is the eleventh day of the lunar month in the hindu calendar.Therefore Ekadashi comes twice a month. It is considered a spiritual day by most Hindus and devotees fast on Ekadashi. The fasting varies for individuals, some fast the whole day without water and food, some just eat fruit and some take one meal. My childhood memories are my grandmother fasting on Ekadashi. My mum would prepare sama or moriyo ni khichdi for her. That would be her lunch and a glass of milk at night. However, we were not allowed to even dip our little fingers in the khichdi to taste it. After marriage, Ekadashi was a fast normally observed by all. So naturally I also got into the habit of fasting on Ekadashi. However, the fast was not so austere. My mother in law would allow us have fruits, nuts, milk, milk based desserts in the evening. It became a fun time for my kids (yes they too fasted) as that’s the only time we would make chips or French fries at home and they were allowed to eat to their hearts content. It did not matter if they could not have ketchup with it. I soon learnt to make a homemade tomato sauce to go with it. Our all time favourite dessert on Ekadashis is Sabudana ni kheer. Very simple to make and a very filling dish.Sago or sabudana is readily available in most Indian shops. Its a filling, satisfying meal. There are days when I just have that along with some fruits. It is recommended that if possible one should fast on Ekadashi without taking any food or water.If that is not possible then its recommended that one fasts partially by taking milk and fruit. If one cannot fast on a light meal of fruits and milk then they can fast but must avoid grains, cereals, pulses in their diet. No onion or garlic is permitted on this day along with so many other spices. It is believed that if one observes Ekadashi fasts then its even greater than visiting any of the pilgrimage places important to Hindus. Fasting on Ekadashi helps to detoxify the body and cleanse the digestive system. Basically the idea of fasting is to make one strong spiritually and control the senses. Some of the foods allowed during an Ekadashi fast are fruits, nuts, milk, roots like potatoes, sweet potatoes, arbi, cassava, coconut, ginger, black pepper, chilis, cumin seeds.One should either prepare food using ghee or nut oils and not oils made from maize, mustard seeds etc. Soak the sabudana in water for nearly 6 to 8 hours. Drain into a sieve and wash under running water. Heat the milk in a heavy bottomed saucepan. Stir occasionally so it does not burn at the bottom. When it starts to boil, add the sugar and the soaked sabudana and stir gently. Its done when the sabudana becomes transparent and floats to the top. Take it off the heat. Add the spices and nuts. Let it cool or serve immediately. When it becomes cold, the consistency becomes thicker. Put the kheer in the fridge to cool. Serve it with grapes, pomegranate, mixed fresh fruit etc. The amount of sugar can be added or reduced according to taste. Can be made a day ahead. The flavours of the spices come out well. If you are diabetic or health conscious, use artificial sweetener. Add it to the kheer after you take it off the heat as some sweeteners when cooked give a bitter after taste. If you like thicker kheer, use 1 cup of sabudana. If the kheer becomes too thick, add a little milk to it. Serve kheer with fresh fruits. This kheer can be served hot also. Sabudana Kheer is a Delicious and drool worthy classic dish, It's been ages since I have prepared this yummy kheer. This kheer is also a traditional Sindhi preparation.. we make it on all auspicious days. Such an amazing looking kheer!! Nothing beats our Indian Milk based desserts. So Comforting. Love to read the significance of Ekadashi and yes you are correct fasting helps to clean our system as well test us. Love how the kheer has turned out so creamy and is so easy to make too. Lovely pics. 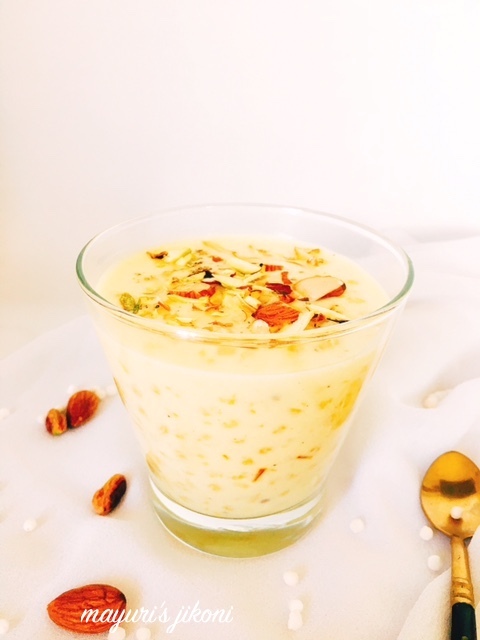 I haven’t yet tried kheer with sago – This looks so good. think this is going to be the next kheer I try. I love your sabudana kheer . I haven’t made it for a long time but will certainly make it soon.